is with dad or his grandparents). Today, I’m super excited to partner with Chateau Ste. 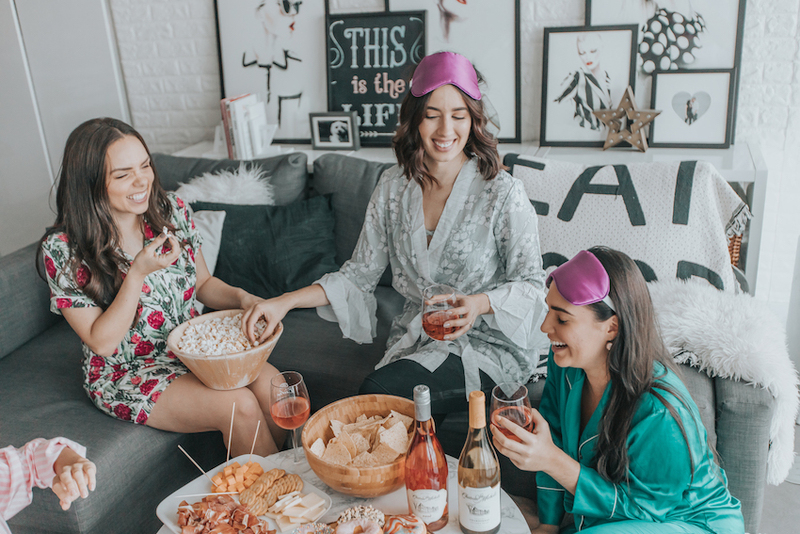 Michelle to share some fun tips on how to host a girly night in. 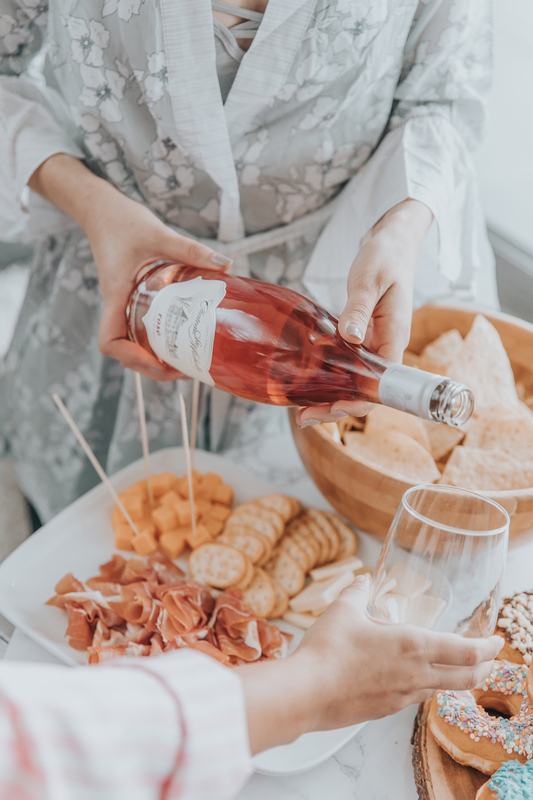 Over the years, I’ve tried to improve as a hostess; so let’s talk WINE (of course! 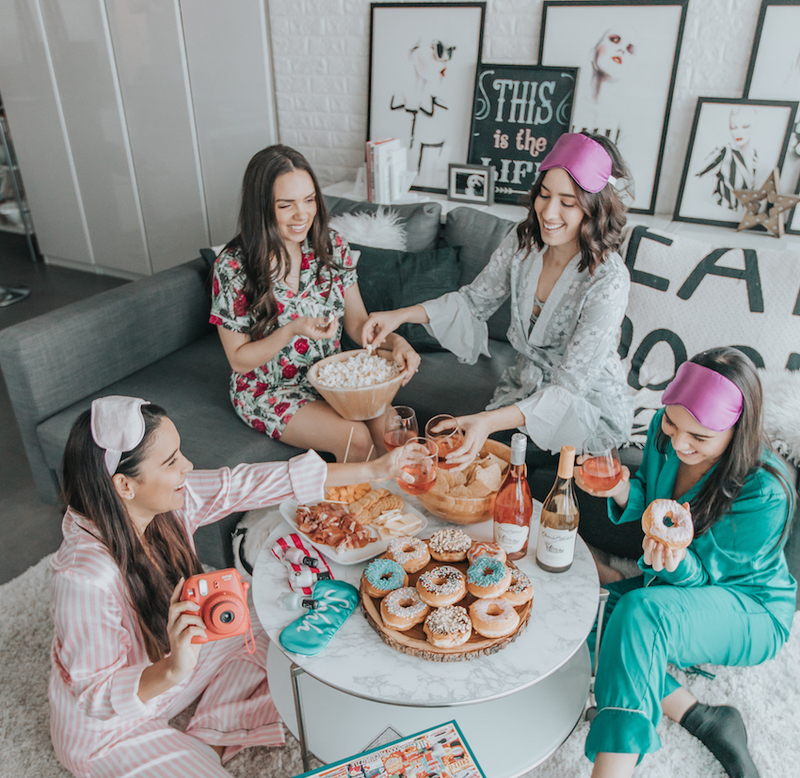 ), cute PJs, food, games, etc... because staying in with your best friends can be even more fun than going out. The overall thought at the end of this get-together was: why don’t we do this more often!!? My friends and I absolutely love Rosé. And we just found a new favorite - Chateau Ste. 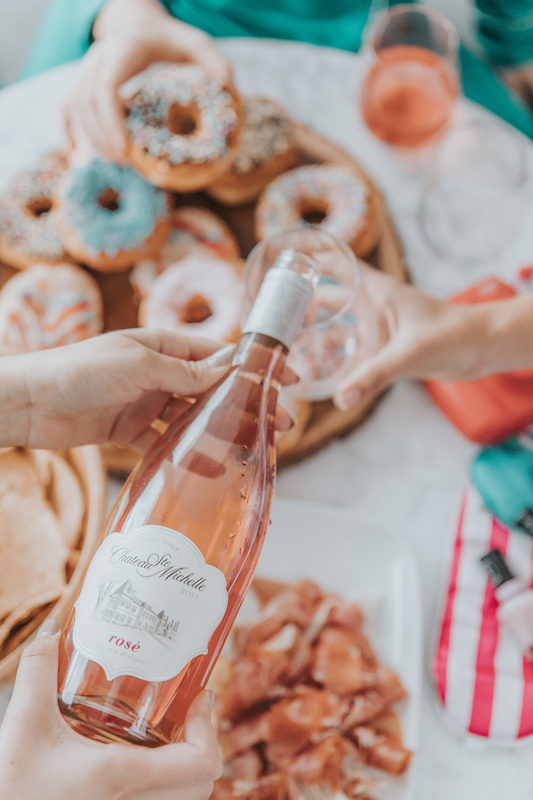 Michelle Columbia Valley Rosé; it’s soft and fresh with aromas of watermelon, raspberry, and flavors of wild strawberry, citrus zest, and hits of lemon. I knew the Rosé was going to be a hit, but just in case anyone preferred white wine, I had a Chateau Ste. Michelle Columbia Valley Chardonnay ready to go! 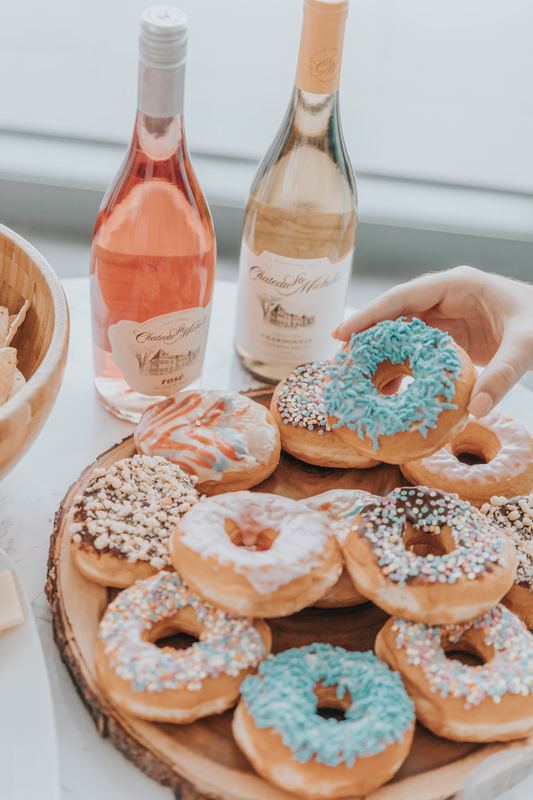 For food, let’s just say this was a mix of things we would have loved as little girls (HELLO DONUTS- make sure to get them in fun colors and different flavors ; and that grown-ups would approve. Say Cheese, little cheese plate with at least two types of cheese and prosciutto! Also a few movie/game essentials: chips + different dips and popcorn! 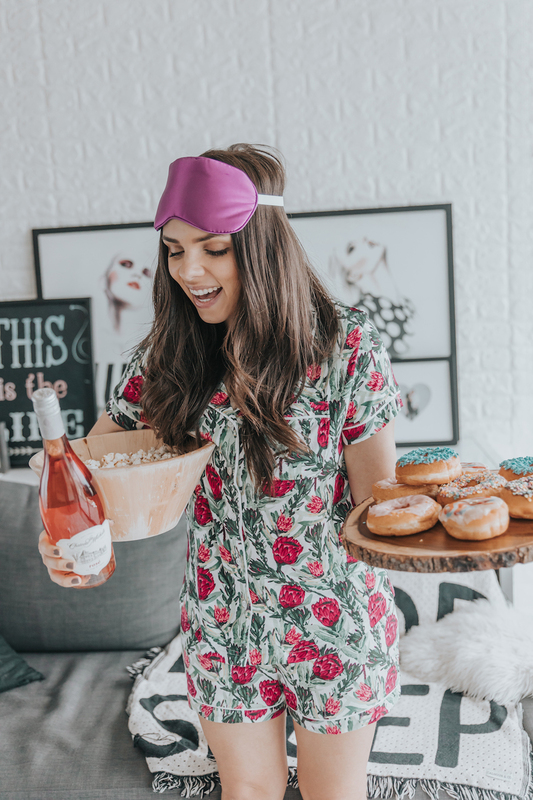 I mean...in my book, ANYTHING goes with ROSÉ! I have a thing for theme parties or parties with dress codes. So if I’m hosting something, my friends know and always ask: what do we wear? 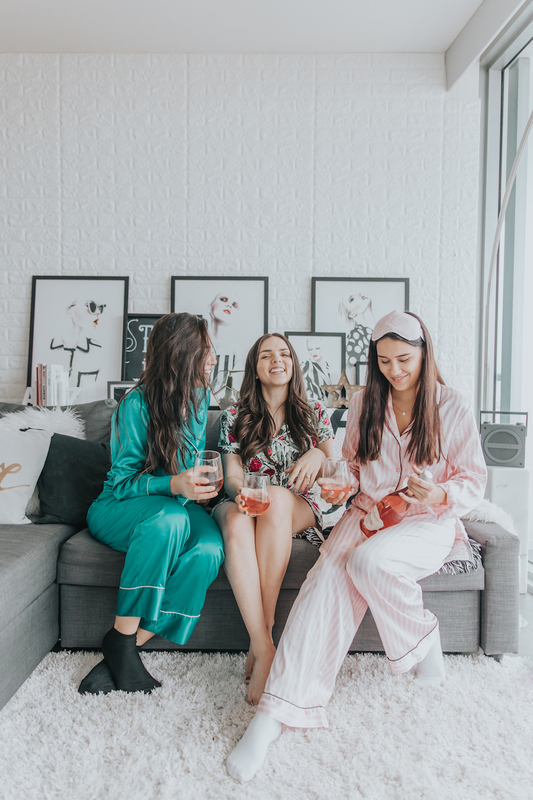 This time I thought it would be fun to just chill in cute pajamas like we were at a slumber party. Confession? I don’t own a lot of cute PJs. I headed out to get a cute pajama set as soon as I sent the invite to my friends. I found this two-piece floral set that was SO comfortable and perfect for the occasion- and now I haven’t stopped wearing it. I definitely have to invest in more cute PJs. I love card games and board games. Slowly, I have collected some of the classics and I still have many on my list to eventually purchase. But you don’t need lots of board games- with ONE deck of cards you can play so many games! Also, the day before I started browsing on the web and adding several chick-flicks to my list. That way we wouldn’t spend too much time searching and they were ready to go. Here are some of the ones I added: Bring It On, 13 Going on 30, Princess Diaries, and P.S I Love You. 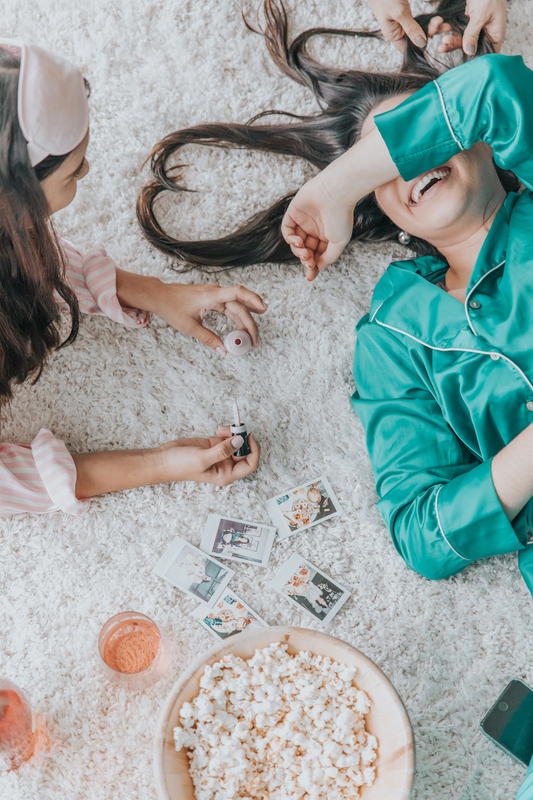 It wouldn’t be a girls’ night in without some beauty pampering. My friend Pao wanted to do her nails, and I wanted to do a face mask! You don’t need to purchase an expensive face mask. There are many easy-to-make face masks with ingredients found in your kitchen. - For dry skin: 1/2 of very ripe avocado + 2 tablespoons of honey + 1/2 teaspoon of coconut oil. - To hydrate: 1/2 smashed ripe banana + 3 tablespoons of honey +3 tsp of yogurt. Just mix the ingredients and apply for 15 minutes. 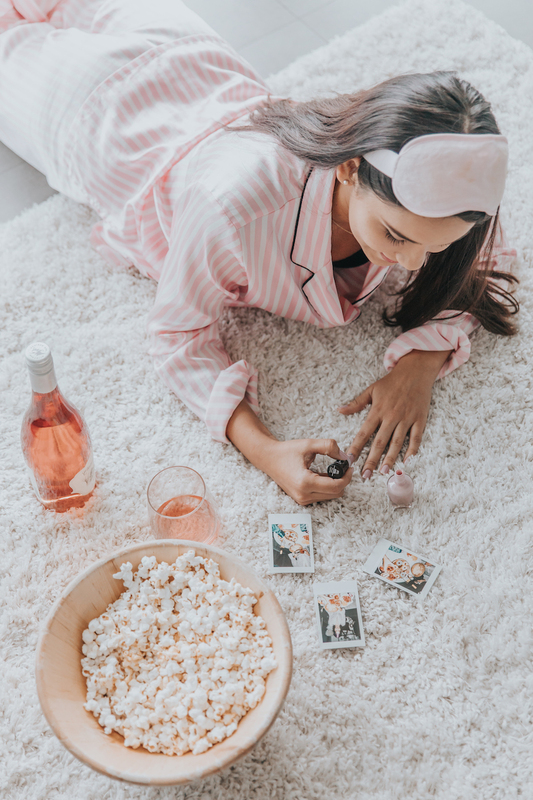 Are you ready for a girl's night in? CHEERS! 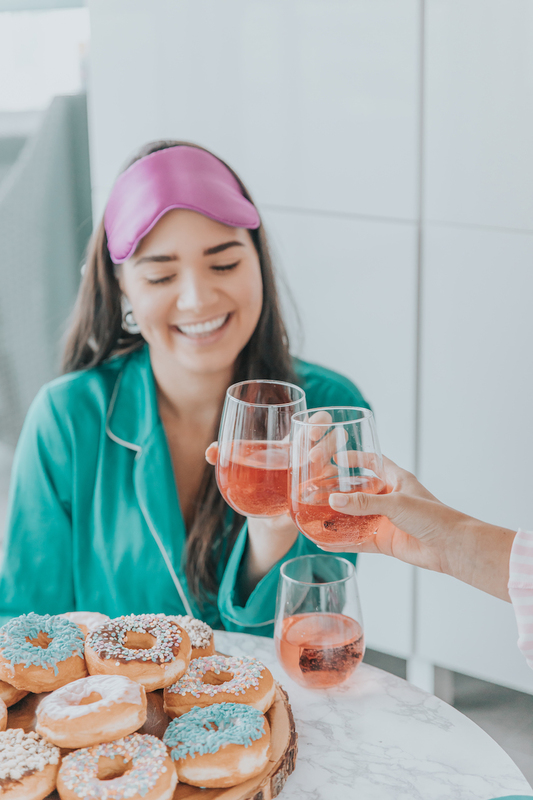 This post makes me wish I had some girlfriends to have a girl's night with.